Yesterday started out as a typical day with a schedule of assisting a County Administrative Assistant in the Louisa County Farm Bureau office with the end-of-year tax package, developing a budget for that same county Farm Bureau, and finishing the day with the Senatorial District Meeting in Zion Crossroads. The Senatorial District Meetings are regional meetings where Farm Bureau producer members meet with Virginia delegates and senators to discuss Farm Bureau’s priority issues for the upcoming General Assembly session. 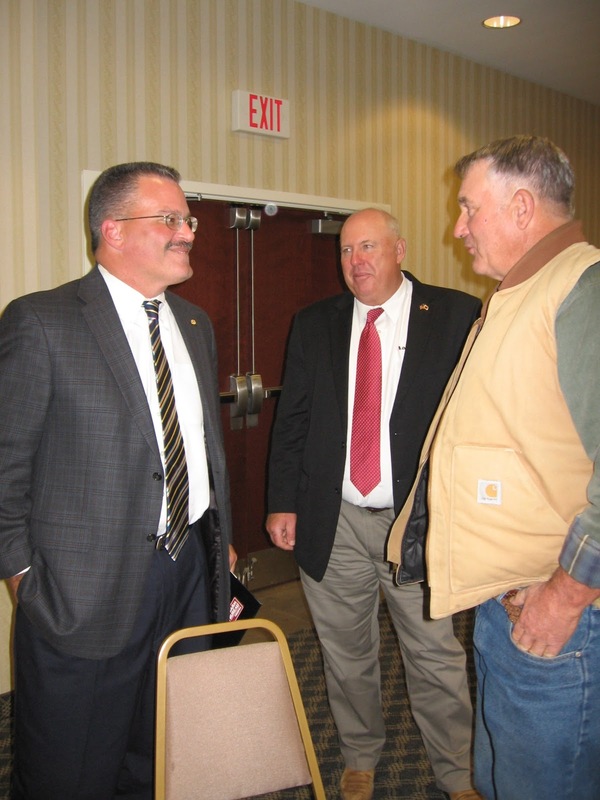 The meeting started at 5:30 p.m. for orientation of the issues for Farm Bureau members. The issues were property rights and trespass, funding for Soil and Water Districts, additional funding for agriculture BMPs, and additional funding for predator control, especially east of the Blue Ridge Mountains. I got to the meeting location one hour in advance to get set up. Upon arriving, the first thing I saw was bare wooden tables with no tablecloths. I quickly remembered that I should have brought some plastic roll-out tablecloth that I had used at this location before, since they don’t provide table linens. Luckily, there was a Wal-Mart across the road. I thought they might have what I needed. After a little searching I found the holiday section of the store where there were some tablecloths, but not the quick, inexpensive, cut to preferred size roll-out tablecloths. Most were all fabric. Alas, I found some that would work. Now my dilemma was which kind to pick. Do I go with the ones with the Santa Claus and elves or do I go with the ones with the holly and pine branches? I went the conservative route and chose the holly and pine branches tablecloths, and I purchased all they had. At about 5:15 p.m., Andrew Smith from the VFB Governmental Relations department called me on my cell phone and said “aahhh, are you going to be here soon and are there no tablecloths?” I replied, “Not to worry. I am pulling into the parking lot now.” Problem solved. Approximately 41 people from several counties in central Virginia were signed up to attend, and everything was perfect when they arrived. Counties represented were Albemarle, Cumberland, Fluvanna, Greene, Louisa, Madison, Orange, and Spotsylvania. The legislators and legislative aides of those legislators that could not attend arrived at 7:00 p.m. They were Senator Bryce Reeves, Delegate Ed Scott, Delegate Peter Farrell’s legislative aide, Stefanie Kitchen; Delegate Rob Bell’s legislative aide, Jordan Dix; and Senator Garrett Jr.’s legislative aide, Susan Lascolette.We had a delicious dinner prepared by a caterer from Madison County that I use quite a bit for Farm Bureau meetings. We even had leftovers, which were quickly snapped up by members at the end of the meeting. There was good discussion on all issues from members and legislators. Senator Bryce Reeves and Jordan Dix, legislative aide to Delegate Rob Bell, especially thanked Farm Bureau members for their yeomen’s work on getting the constitutional amendment on eminent domain passed by such a wide margin. Several members were very knowledgeable about the agriculture BMPs, watershed implementation plan, cost share conservation programs, and soil and water districts. Brad Jarvis of Madison County was one member who gave detailed information on these areas. Members with this wealth of knowledge on issues and testimonials provide the legislators a keen understanding of the issues. After a successful meeting, I looked back on my day–a day that involved analyzing financial statements, crunching budget numbers, picking out tablecloths, and discussions of policies with state legislators. That’s a day in the life of a Farm Bureau fieldman. To cap off the day, I cranked up a little George Strait and Jason Aldean on the radio for the drive home. I will have a few days off for the holiday and weekend with some down time and relaxation of splitting wood, synchronizing cows to get them ready for A.I. breeding, and, of course, spending time with family on Thanksgiving. I wish you a wonderful Thanksgiving and the time to cherish your family.